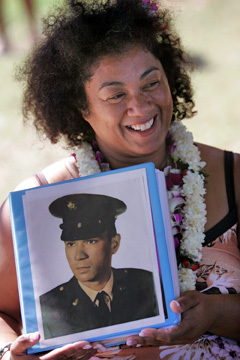 Sarah Michel held a photo of her father yesterday during a family party at a Makapuu beach. Michel, of San Diego, recently learned her father was Hawaiian and that she has family on Oahu. Her father was a U.S. soldier who was killed in Vietnam in 1968, two months before she was born. He had no face, no hometown, no family and only a first name: William. Sarah Michel would dream about him, though, wearing his Army fatigues, fighting the Viet Cong, wooing her mother. He was out there somewhere, she told herself, and one day he would find her and make up for all of the lost time. "For most of my life, I had this empty feeling inside of me," Michel said, closing her eyes to hold back tears. "I've been longing for him. I've been dreaming about him." After so many years of wishing and searching, the 36-year-old San Diego resident finally found her father. And yesterday, in a quiet moment with her fiance, she placed flowers on his gravestone at the National Memorial Center of the Pacific at Punchbowl. Cpl. William Kapena Alameda, who was born in Hilo and grew up in Waimanalo, died in the Vietnam War when he was 24 years old. He left behind 10 brothers and sisters -- and an unborn child, whom his family never knew about until getting a call from Michel in August. All seven of Alameda's surviving siblings have since welcomed Michel into their lives. Family members on Oahu met her for the first time on Friday night and gathered at a Makapuu beach park yesterday for a Hawaiian-style potluck. They are already urging the San Diego resident to pack up and move to the islands. They want her to get to know her big extended family, which includes 75 cousins and 175 second cousins on Oahu and the Big Island. "To know that my brother lives, even though he's dead -- that's the best thing," said Waimanalo resident Gordon Alameda as he sat next to Michel with his arm around her shoulders. "In a way it was kind of hard to believe. I couldn't figure it out." Michel stood with her uncles Gordon Alameda, right, and Alfred Alameda during the party. Michel's mother, a Vietnamese woman who now lives in San Diego, met William "Billy Boy" Alameda in 1967. She was working on an Army base in the Vietnamese province of Tay Ninh, where Alameda was stationed. They fell in love despite a language barrier. At one point, Alameda hired an interpreter so the two could talk, Michel said. When Michel's mother found out she was pregnant, Alameda took a picture of her -- which Michel carries -- and took it with him onto the battlefield. When he died on Nov. 1, 1968, a fellow soldier returned the photo to Michel's mother, who knew the father of her baby's child only by his first name. As Michel sat under a tent on the beach with her fiance and members of her family yesterday, she pulled out the photo from a thick binder full of memorabilia gathered during her search. She pointed to the wallet-size picture gingerly, knowing her father had taken it on a sunny, happy day in Vietnam with war all around him but only love and hopes for the future in his heart. When she was 4 years old, Michel was put up for adoption. Her mother worried that her American looks would get the child in trouble. The safest thing, she reasoned, was to ship her off to an orphanage, where she was quickly adopted by a couple in Michigan. Until she was 16, Michel had big question marks for biological parents. She also thought she was half African American. But one day, her adoptive parents got a call from their adoption agency: Michel's mother was looking for her daughter. Their first conversation, which was over the phone, consisted of little more than crying. They met a few months later, and Michel learned she had three half siblings, two by a Vietnamese father and one by an American doctor. When Michel got older, she gradually gained interest in her father. Who was he, she would ask her mother. What did he like to do? What did he look like? Many times, Michel's mother clammed up at the questioning. But sometimes she would talk about him -- his dashing good looks; his sweet, lilting voice; his knack for music. Michel's mother did not know where Alameda was from or whether he had family. She, too, thought he was African American. In fact, Alameda was Portuguese Hawaiian. Finally, Michel stopped asking about her father. "I gave up on the search," she said. But her fiance, Johan Oeyen, did not. He was intent on finding her father and for more than two years searched military Web sites and discussion boards for clues. 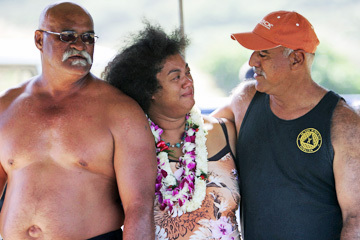 Sarah Michel, her uncle Gordon Alameda and Michel's fiance, Johan Oeyen, talked yesterday during a Makapuu beach party. The breakthrough came all at once -- and purely by mistake. For years, Michel's mother had been saying Alameda's middle name was something like "Alan." At the dinner table one day, Oeyen spelled the name out and asked, "Like this?" No, Michel's mother said, it was A-L-A-M.
At first, Oeyen thought the name was Middle Eastern. Then, he went to an Internet listing of those whose names are on the Vietnam Veterans Memorial Wall in Washington, D.C. When he typed in the four letters, three names came up: two Alamos and one Alameda. When Michel saw her father's name, she said, she was certain she had found the man who had fallen in love with her mother and died before she was born. They found out Alameda had been in Vietnam about the time that Michel was conceived and was based in Tay Ninh, where Michel's mother had worked and where Michel was born. When Michel and Oeyen contacted the Alamedas, they were skeptical at first. But, they said, they were soon convinced. 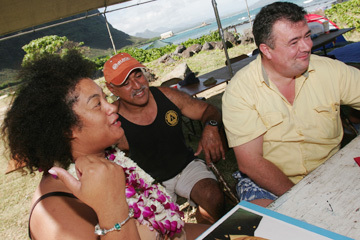 One uncle in Hilo told Michel when he saw a photo of her that she "looked like one of us. Welcome to the family." A DNA test completed a week before Christmas confirmed Alameda was Michel's father. Now, Michel is learning everything she can about the family she never knew. She plans to stay in the islands until Wednesday, visiting her dad's old stomping grounds and learning more about her heritage. And even though she never got to meet her father, meeting his brothers and sisters makes her feel complete. "Just touching him," she said, putting her hand on her uncle Alfred's back, "I feel my dad."